What did Fischer die from? Each year of life is one chess square. He got to the edge – and decided to leave. That’s what I think. Some laugh when they hear your stories about aliens. Has anyone famous told you something similar? Yes. For example Vasily Vasilyevich Smyslov – a highly respected man. A knockout World Championship was taking place in the Kremlin. 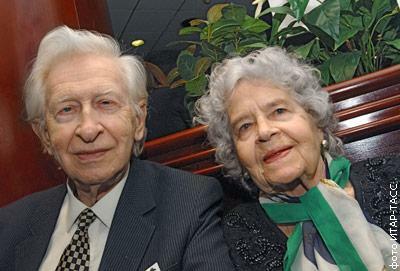 At the banquet Smyslov unexpectedly approached with his wife Nadezhda Andreyevna, took me by the arm and motioned me to the side. “Kirsan Ilyumzhinov, look me in the eye. I heard your appearance on [Radio] “Svoboda”. You said you’d met aliens. Were you telling the truth? Yes or no?” “Yes”, I replied. “There’s no reason for me to lie”. Smyslov sat down on a stool: “Nadenka! I knew that Kirsan wouldn’t lie! That’s it, allow me to…”. I was also interested – what exactly? Smyslov said: “I’ve been silent for thirty years. A Professor, a World Champion – I was afraid to be considered a madman”. It turns out that in 1974 Vasily Vasilyevich had contact with aliens. His wife is a witness. He was playing a Candidates Match with Huebner and fell ill. The game was adjourned and he returned to his hotel. He hadn’t managed to turn on the light when someone set up the position for him, and began to tell him how to play. 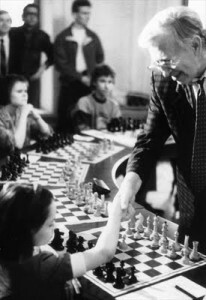 The next morning Smyslov made those moves – and won. A day later it all happened again. 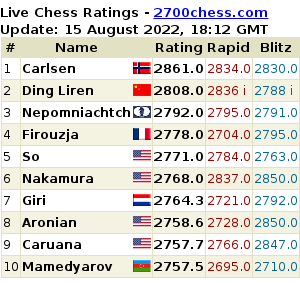 As Evgeny Surov pointed out almost immediately at Chess-News, something’s gone wrong here on a simple factual level. 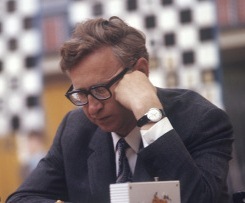 Huebner and Smyslov didn’t play a Candidates Match in 1974, but in 1983. During that match the players won one game each – so the phrase “a day later it all happened again” is, to say the least, puzzling. The game Smyslov won is, however, worth including as a demonstration of the quality of his play when he was already in his 60s. The game may well have been adjourned, though it’s doubtful whether the win at that point demanded the help of extraterrestrial intelligence. As is often the case with Ilyumzhinov, it’s hard to know what credence to give his words. Kasparov, for instance, was recently quoted as saying: “He’s capable of passing any lie detector test because he believes what he says.” The self-serving nature of the quotes Ilyumzhinov attributes to Smyslov (“I knew that Kirsan wouldn’t lie!”), and Fischer (“For the first time in my life I haven’t been deceived”) set alarm bells ringing, though if the stories are fabrications they’re nevertheless cleverly designed to have an air of plausibility. Judging by Vasily Smyslov’s late interviews (three of which I quote from below), it’s easy to imagine him talking about receiving outside inspiration for his moves, though the revealing interviews are indicative of a deeply religious man, with no suggestion whatsoever of alien encounters. 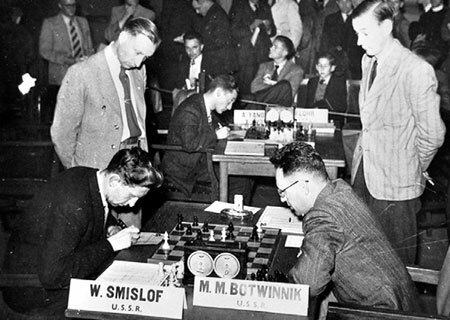 The Smyslov-Huebner match, for example, is actually famous for its extraordinary denouement. When four extra games proved insufficient to separate the players it was decided that the match result would come down to the spin of a roulette wheel in a Las Vegas casino. Smyslov commented on the outcome in an interview available in English at GMSquare. The literary references are to Dostoevsky’s The Gambler and Pushkin’s Queen of Spades. My own experience shows that Devil fights God in chess as in real life, and the field of the battle is not the chessboard but in people’s hearts. I realized this after my match against Huebner that ended in a draw. Lots were cast for the winner, in a casino. It was the first time I had the feeling that I could not influence my own fate. Roulette was to decide the outcome and a golden ball was used to avoid magnetism. If the ball landed on a red number I would be the winner. A black number would give victory to Huebner. The ball was thrown and it fell on the “zero”, as in Dostoevsky. There was no winner. The ball was thrown again and this time it landed on the red number “three” (the first number of Pushkin’s famous three cards: three, seven, ace). I won the match in this way. Later it dawned on me that God had been fighting Satan in the casino and they had made a draw the first time. But, eventually, God won and sentenced Huebner to defeat. As far as I know there were good reasons: Huebner’s behaviour was incorrect during the match. The loss of Smyslov is the end of an era. One of the few remaining World Champions has gone. The oldest remaining now is Boris Vasilyevich Spassky. We wish him good health, although we know he’s recently had problems. And we’re left with almost no more World Champions. Smyslov has gone, Spassky is left, and then there’s Karpov. Fischer’s gone. That’s it. We’ve come down to Karpov and Kasparov, who are still active today, in part politically. And, of course, such losses don’t go unnoticed. It’s already the 21st century, and we’re losing the best people from the last century. That is, of course, the main sorrow of the last year. “Then there’s Karpov” sounded almost like a note of doom on your lips. No, it’s simply that it is, in fact, quite terrifying. Karpov is essentially a contemporary of both of us. Boris Vasilyevich practically doesn’t play anymore. He played a match against Korchnoi (brilliantly, by the way) and after that… Realistically he’s in chess retirement now. So we essentially discover, unexpectedly, that our contemporaries are still playing, and after them – no-one. The great are leaving us. By the way, Bent Larsen also passed away, and Lilienthal before him. So of course this year has turned out to be a black one. True. And you… I’ve been addressing you at times as a commentator, at times as a chess player, and at times as a trainer. Now as a trainer could you tell us: what associations does the name Vasily Smyslov have for you? Smyslov passed away. What immediately comes to your mind? Forgive me, but I’ll look at it, first and foremost, simply as myself. I studied in the school of Vasily Vasilyevich Smyslov, and remember him from my youth. Therefore, of course, it’s simply part of me. Firstly, he would come to our school. Secondly, when I was nothing more than a promising candidate master I took part in a simultaneous session to prepare him for the Candidates Matches in which, by the way, he performed brilliantly in the 80s. Then in the 90s our paths also crossed. Four years ago I interviewed him. In general, he knew me, we talked, and for me it was quite a serious loss. I was lucky to have been able to spend time with him, so it had great significance. Well, and just think of those other names… It’s clear that together with Smyslov we’re also losing all his matches, all the heroic feats he achieved in his life, and there were a great number of them. It’s clear that Smyslov is Botvinnik, Smyslov is Tal, Smyslov is Keres, Smyslov is Petrosian, that whole époque. He’s the last of them to go. Perhaps it’s worth briefly mentioning what Smyslov’s school actually was, as little’s known about it outside Russia. GM Mikhail Krasenkow, another alumnus, recently wrote an article about the school for ChessPro. He explains that in the late 1970s Botvinnik had the idea that other leading grandmasters should establish schools similar to his. 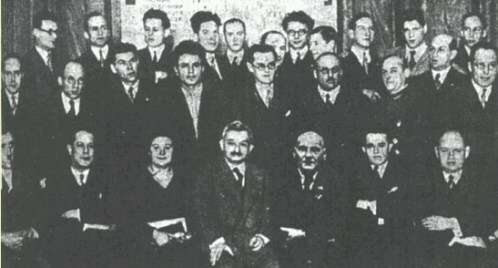 Smyslov’s school ran from 1978 to 1987 (the whole system collapsed with the break-up of the Soviet Union). It selected talented young players and brought them together in different locations (e.g. 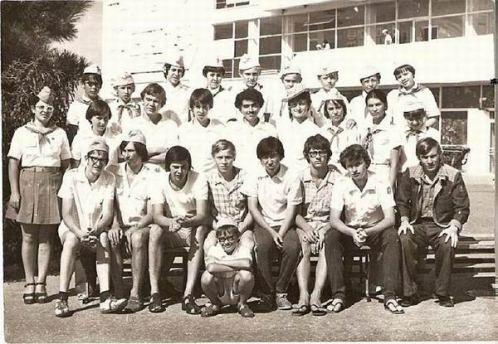 a children’s camp on the Black Sea) for sessions lasting a week to a month, a number of times a year. The curriculum involved lectures by well-known coaches, homework (especially between sessions) and a wide range of training methods e.g. 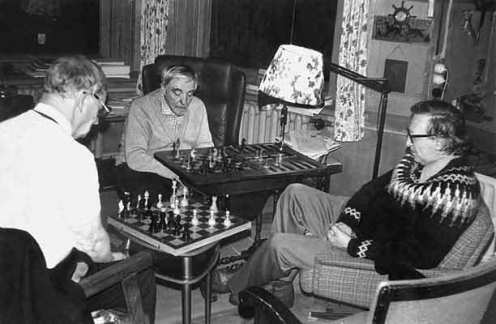 Krasenkow records a training game played by two teams of four players, with the players then analysing the game in detail the next day with Smyslov himself. The keystone of the school’s work was the idea of young chess players getting to know each other. We had experienced trainers, and their lectures were very useful and educational for the listeners; but the spirit of friendly competition was no less important. The kids had an incentive to master as much as possible and enhance their play. When the young gather together each of them wants to prove himself, his abilities. Many of our students have now become eminent chess players: Valery Salov, Evgeny Bareev, Alexey Dreev. But what naughty boys they were! I remember that I played football so badly, and so often kicked my opponents’ legs instead of the ball, that I was eventually appointed… referee! I refereed very strictly and once dared to show a red card (in the form of a faded autumn leaf) to Boris Gulko himself. Alas, the grandmaster left the 13-year-old teenager in disarray: he simply wouldn’t leave the pitch, and that was that! The present is a time of universal acceleration, but that isn’t always for the best. Chess is losing its depths, while chess players are damaging their psyches. Therefore I consider preserving the classical time control to be a matter of the utmost importance. There’s a philosophic postulate which states that the ability to create divides man from the whole animal world. 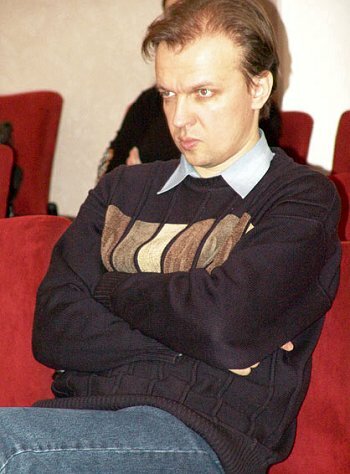 Romanovsky told us, his pupils, that the creative approach is an essential quality in a chess player. Alekhine thought chess is distinguished from other games because in it the spirit triumphs over matter. In a game you can sacrifice material and give up lots of pieces in order to then announce mate. Tartakower said: a chess combination is a triumph of the spirit over matter. It’s precisely a creative chess player who can find a logical principal amid chaos – seize the situation and find the expedient approach. What I call the search for harmony. Remember Morphy and Capablanca. They had a gift for melody, perfect chess pitch. They found the correct decision using an intuitive perception of the position. It’s precisely that use of intuition that allows the most talented chess players to find what’s hard to calculate. They’re closer to the Heavens, closer to the unified information field of the Universe. The concept of talent can be explained in the following manner. I met Pyotr Leonidovich Kapitsa on a number of occasions, and played him at chess. He was an exceptionally talented man. A pupil of Rutherford’s, a brilliant experimenter.There’s an anecdote about him. When he was in a laboratory in England a very expensive hydraulic press stopped working. No-one knew what to do, so they turned to Kapitsa. He said – I can do it, and it’ll cost you 1000 pounds. They asked him what he needed to do the job? Kapitsa replied – a sledgehammer. He took it and hit the press! And it started working. The Englishmen exchanged glances and began to chide Kapitsa, saying do you really think such a repair is worth 1000 pounds? Yes, he said, the blow with the sledgehammer is only worth one pound. But knowing the point at which to hit it – that really is worth 999 pounds! That’s an example of his outstanding intuition. It’s pretty much the same in chess… Recently, around three years ago, I was in the Danilov Monastery, talking with the church ministers. It turns out that a decision’s been taken – at the level of Patriarch – that chess has been recognised as a useful occupation contributing to man’s spiritual growth. That’s very significant! Both for me personally, and for chess as a whole. I was very glad to satisfy myself that I’d devoted my whole life to something that was useful for people. A man should go through a certain path of growth, and he can also do that in chess. Finally, this section of a much longer Smyslov interview for Radio Svoboda in 2005 is a vivid reminder of what Shipov said about how the loss of Smyslov also means the loss of a link to the great players of the past century. Note that Lasker would have been 67 in 1935. You know, I remember 1935, when I went to the Museum of Fine Arts with my father and saw Lasker and Capablanca play. For me they were absolutely untouchable figures: watching them play I was enchanted. Lasker didn’t get out of his chair. He was brought a cup of coffee and would carefully and very astutely handle the position in his game. And, by the way, he didn’t lose a single game then, and finished third behind the winners Botvinnik and Flohr, who were first and second. The play of Capablanca, on the other hand, was spontaneous and free-flowing. His intuition was stunning! In general, you can divide chess players according to their understanding of chess into chess-calculators, who, like computers, calculate positions (though a man can’t compete with computers when it comes to calculation, of course), and those who understand positions. 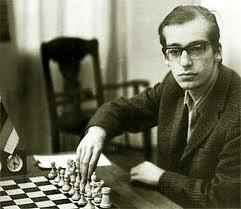 Botvinnik, for instance, was a chess player who understood positions. Lasker was a real chess fighter. Capablanca intuitively understood chess, and was a man of absolutely stunning qualities. Perhaps his play could be compared to Mozart’s music – he grasped positions with amazing ease and speed. At that tournament there was a two-hour break, and the Soviet players were analysing an adjourned game. They were looking for a win against Flohr, who at the time was fighting for first place. Capablanca walked past and they asked him: “Maestro, what do you think needs to be played here?” Capablanca took a quick glance at the position and didn’t want to get involved in that sort of debate, as he was a real gentleman, so he simply showed a manoeuvre: transferring the king from one wing to the other – and it was a draw. Our masters exchanged glances and nevertheless tried to find a win – and as a result the master who had to resume the game lost. Capablanca’s plan was the only better option, meaning that he’d instantly grasped the essence of the position and the encounter. And if you’re talking about the whole atmosphere of that time, I don’t know whether that age should be called the golden or the silver age! There were no computers back then, and people’s attention was so focussed on chess that I think I lived a very interesting life in chess, and consider it to have been even more attractive than now, when computers have appeared. The computer provides absolutely staggering examples of penetration into chess, of course. Let’s say, if you set up a position on the board with five pieces the computer gives an instant reply. For example, the two kings and rook and pawn versus rook, or queen and pawn against queen – just set up the position and the computer responds: “Mate in 73 moves”. Now they’re even attempting to calculate the positions with six pieces. And to a degree – from a philosophical point of view – that makes you realise that chess is subject to mathematical law – or that with a small number of pieces there are a series of correspondences. While the more pieces the greater the difficulty of creating a program for the computer. Perhaps the Universe is built according to the laws of mathematics, but it’s God who’s in control of those laws. While we, people, still try to get to the bottom of those laws, also in chess, on a modest board, where everything is subject to various searches – the search for harmony and beauty. That’s the formula I apply when defining talent in chess. What does the search for harmony mean? Lasker and Capablanca talked about the interaction of pieces and pawns on the chessboard. It’s roughly the same concept, but applied to a person – in each profession a man has a talent which clearly defines his professionalism. And that professionalism shows through in how quickly he grasps that harmony and interaction of the pieces and pawns on the chessboard. Thank you for the wonderful translation ! Its so deep and insightful. I need to read it some more times. Thanks, Bernard! You’re quite right – it was Groningen 1946 (or at least I found the photo so labelled elsewhere). I’ve changed the article. Incidentally, I thought of you today during the commentary on Carlsen-Aronian – I decided “refutation” was appropriate for 18…d5 (“очень сильное возражение”) on this occasion, though I still had my doubts! I’m 61. I find it exhilirating to have played over and over the games of Smyslov and his predecessors.